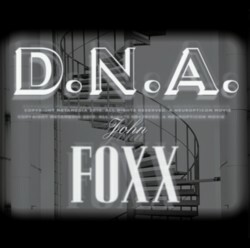 We're excited to announce DNA - a new double disc, CD & DVD release by John Foxx, which is exclusively available through Townsend Records. This features unique collaborations between Foxx and some of his favourite film-makers, with all of the short movies on the DVD being made especially for this project. On top of that, CD 1 features all the music for the films, plus tracks that Foxx had recorded as 'possibilities' for soundtracks. However, as there was already penty of material, they didn't get used in the end - the electronic 'Phantom Lover' and treated piano of 'A Secret Life 7'. The final track on the CD, 'Over The Mirage' is a new collaboration between Foxx/Harold Budd and Ruben Garcia, while both 'A Secret Life' 2 & 7, and 'Violet Bloom' were recorded with Steve D'Agostino. Ex-Japan percussionist Steve Jansen also features on the 'Secret Life' instrumentals. All of the stunning artwork for the project has been designed by Jonathan Barnbook, who has previously worked with Damien Hirst and also David Bowie, designing the sleeve and inner booklet for his Heathen album in 2002.